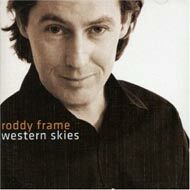 Roddy Frame’s Western Skies is a strong contender for my favorite album of 2006. It’s everything you expect from the man behind the quintessential cardy pop band Aztec Camera: nimble, haunting, surprising and eloquent. The sad thing is a lot of people who loved Aztec Camera may not even know it exists, because none of Roddy’s three superb solo albums (The North Star , Surf , and the aforementioned Western Skies) have been released in the US. As one of the very best songwriters of my generation, Roddy Frame belongs in a class with Elvis Costello, Neil and Tim Finn, Suzanne Vega, Billy Bragg, Tracy Chapman, and the teams of Morrissey/Marr and Difford/Tilbrook. So it seems particularly unjust that Roddy’s most recent albums aren’t getting the attention they deserve in the US. Fortunately, it’s the age of the tube-o-net, so at least you can get them online. Here’s a video of Roddy performing the album’s title track live in a small club. It looks like a video someone shot on their phone, so the sound quality is dodgy and sometimes you can hear the audience talking over the music. But it’s good to enough for you to catch the flavor of the album, and confirm that Roddy’s stunning melodic gifts are as sharp as ever â€” and even pushing forward into new territory. There’s a charming moment near the end where the song pauses, and the audience bursts into applause thinking it’s over. Roddy just laughs good-naturedly and keeps going. Lovely…and nimble playing. Reminiscent of the quieter moments of the Finns. *still harboring my Neil crush* Thanks for that.